There is a need for solar panels in all solar power systems, since it is the component which transfers the energy of photons (sunlight) into electrons (electricity). Poly(crystalline) or Mono(crystalline) – Using polycrystalline solar cells or monocrystalline solar cells for the production of a solar panel once was more important. The difference in terminology refers to a difference in the production process of the cells. Nowadays the differences have become very modest. The only advice we give is using monocrystalline solar modules if aesthetics are important or when there is a limited availability of (rooftop)space. Watt or Wattpeak (Wp) – Wattpeak stands for the the amount of power a solar module produces under standard test conditions. Most commonly used solar modules (especially on-grid) have 60-cells or 72-cells. Generally, these solar modules have ratings of respectively 260-290Wp and 310-350Wp. In smaller off-grid projects the often used solar panels are between 5 and 200W. Maximum Power Voltage (Vmp) – The maximum power voltage depends on the circumstances. First of all when the inverter or charge controller uses a Maximum Power Point Tracking (MPPT). In this case, the voltage of the solar module is less important. This is however often not the case for small off-grid systems. In these cases, solar modules with a nominal voltage of around 18V are used for charging 12V batteries whereas 36V solar modules (or two 18V solar modules in series) are used for charging 24V batteries. Module Efficiency (%) – Unless there is a lack of available space, it is normally not advisable to opt for highly efficient (and costly) solar modules (>18%). Currently normal solar modules are 16-18% efficient. Nowadays, the production of most solar panels (90%) happens in Eastern Asia with the vast majority coming from China. Although most factories use highly automated production lines nowadays, there are still some factories with low quality solar modules. The desired lifetime of a solar project is probably the most important aspect in choosing the right module. In case a project needs to work the coming 5 years, probably any solar module suffices. If the project aims at a lifetime of 25 years, it is smart to go with a Tier-1 solar module manufacturer. Bloomberg New Energy Finance (BNEF) determines which manufacturers are Tier-1 solar module manufacturers. In case the same particular manufacturer of solar modules appears in multiple large scale “bankable” projects, the manufacturer can become part of the Tier-1 list. The brands with a strong presence in Africa who hold the BNEF Tier-1 are Suntech and Jinko Solar. There are plenty of manufacturers who try to “cheat” within this system, by putting labels of for example a higher wattage than the actual output of the solar system. Unfortunately, these modules are often sent to Africa as there are not any suitable testing facilities to avoid these practices. This does give one another reason to choose to buy from a Tier-1 supplier. When buying from shops on the streets, measuring the panel size is a a very basic test to check whether the label matches the output. Normally you would expect roughly 160Wp for each square meter of surface area. If a solar panel measures 60cm by 100cm and has a label for 120Wp you are probably not buying a 120Wp solar module. The charge controller choice very much depends on the overall system design. DC-coupled off-grid systems are the only systems that use Solar Charge Controllers. MPPT or PWM – The system size mainly decides the choice whether to use a Maximum Power Point Tracking (MPPT) solar charge controller or a Pulse Width Modulation (PWM) solar charge controller. The cheaper PWM charge controllers are primarily recommended for small systems with just a few solar modules. The voltages of the battery needs to match the voltage of the solar module. Read more about the difference here. Voltage – The voltage depends on the design of the system. Most charge controllers have an integration option in systems with multiple system voltages (12, 24 and 48V). The actual charging voltage is dynamic and depends on the settings of the charge controller. Rated Charge Current – Depending on the voltage, the rated charge current determines at which rate the batteries are chargeable. The optimal rate depends on the specifications of the connected batteries and solar panels. In the long run, getting a good quality solar charge controller pays off. A good solar charge controller can do little harm to the solar panels. However, a bad quality charge controllers, or one with the wrong settings, can greatly damage what is normally the most expensive part of a solar power system: the batteries. A good example is Morningstar, an American based company specialized in solar charge controllers. They have been optimizing their robust products for the past 25 years. Another example is Victron Energy, who also has the complete range of controllers with the additional benefit that it is possible to use only one monitoring solution when also using an inverter. The German company Steca also has a good reputation, however, the use of their products seems to be limited in Africa. The battery is the most expensive component in most off-grid solar power systems. There can be a difference in system lifetime ranging from 6 months up to 15 years, solely based on choosing the right battery (and combining it into a solid system design). Currently, the most common battery type is still based on lead-acid technology, however, it will not take too long before li-ion will start taking market share. More on these batteries below. Flooded Lead-acid batteries – Flooded batteries generally need to be filled up with battery water (demineralized water) once in a while. When well maintained, the lifespan of these batteries are slightly longer than AGM and Gel batteries. AGM Lead-acid batteries – Absorbed Glass Mat (AGM) batteries, are batteries which are most often used for small off-grid solar power installations. They hardly require any maintenance which makes them good in situations without access to technicians or caretakers. Gel Lead-acid batteries – These batteries are generally the most expensive lead-acid battery type. They also do not require any maintenance and perform slightly better with higher ambient temperatures. For a good description of the characteristics of lead-acid batteries and the differences between the technologies read this article on batterystuff.com. Li-ion batteries have a normal lifespan of 7 to 15 years, although this depends on application and type. Until a few years ago, it made more sense from an economic perspective to buy Lead-acid batteries and replace them every 3-5 years instead of buying Li-Ion. However, due to the rapid cost decline of Li-Ion batteries, it is now economically beneficial to go with Li-Ion batteries when the life expectancy of the batteries is rather long. The upfront investment is still higher, however, the total cost of ownership or cost/kWh stored is lower. There are 5 dominant Li-Ion technologies which all have their own benefits/drawbacks. The most common Li-Ion battery types are NMC and LFP. For a more extensive outline of Li-Ion battery technology read this article on batteryuniversity.com. Voltage – The preferred system voltage normally comes from the system design. 12V, 24V and 48V are the most common. To reach these voltages one can choose either 2V or 12V (and sometimes 6V) battery cells connected in series, parallel or both. As a rule of thumb it is good not to connect more than 4 battery (strings) in parallel. Amp Hour (Ah) – The Amp Hour rating of a battery tells you how much energy it can store. It is useful to multiply with the voltage in order to compare different batteries. A 12V battery of 200Ah has the same capacity as a 6V battery of 400ah (both 12V * 200Ah = 2400Wh or 2,4kWh). Please note that the actual storage capacity depends on many factors including DoD, discharge rate and temperature (see below). Depth of Discharge (DoD) – The Depth of Discharged is the discharging level of a battery. As a general rule, it is not recommended to discharge lead-acid batteries more than 50% to avoid damaging the batteries and decreasing the lifespan. This means that the above mentioned 2,4 kWh battery actually only has a usable capacity of 1,2 kWh. Li-Ion batteries are normally discharged much more, generally up to 80 or 100%. Number of cycles – The “number of cycles” or “cycle life” is the amount of “cycles” a battery lasts. One cycle is one discharge of the battery to a specific DoD. Batteries are able to perform many more cycles to a low DoD (for example 20%) compared with a high DoD (80%). Though the cycle life is sometimes stated on the datasheet, be wary of trusting the stated cycle life as there is an incentive for the manufacturer to inflate this number. At 50% DoD the cycle life for Lead-acid batteries can vary from 300 – 3000 cycles (1 – 8 years), Li-Ion batteries are generally able to last for 2000 – 8000 cycles (6 – 20 years) at 80 or 100% DoD. Aside from DoD the cycle life also heavily depends on ambient temperature and the charging pattern. When looking at datasheet of a battery one can see many more characteristics. The best way to find the right battery type and quality for your project is by someone with a lot of experience in doing so. You can contact us or request a quote. Since lead-acid batteries have been around since the 19th century there are many manufacturers and applications. Many of them have a line specialized for deep-cycle / renewable energy storage applications which generally require somewhat thicker lead plates. Surrette/Rolls, Deka and Trojan Batteries (all from the USA) batteries have been used in many African countries for years, especially for the smaller 12V battery banks. Larger battery banks made up of 2V cells are more often made to specification by BAE or Hoppecke (both from Germany). The Kenyan brand Chloride Exide has a particularly strong presence in East Africa. The little use of Li-ion as of yet, makes them absent of a market leader. The integration into the solar home systems is increasing, however, these selling of these systems happens under one brand name (instead of multiple individual components). Which inverter to use also very much depends on the overall system design. Smaller DC-coupled systems normally do not use an inverter as all the connected appliances would run on DC-power. Larger systems DC-coupled systems which power AC-appliances do need an inverter. In case it is also necessary to be able to charge the batteries when the sun is not shining, a inverter/charger is necessary. An example is connecting an inverter / charger to a generator or the grid. AC-Coupled battery based systems use at least one PV-inverter and one inverter/charger. Read a further explanation between the differences between AC-Coupled and DC-Coupled systems here <link to the process>. When the system lacks the adding of a battery, and in the mean time used for direct self-consumption or grid feed-in, this only requires the PV-inverter. Nominal output – The nominal output determines how many and which appliances you can power with the inverter. With a 2000W inverter you can power one 2000W hair dryer or four hundred 5W LEDbulbs. Normally inverters can provide a higher output for a limited time period. Charging current – An inverter/charger can also charge the batteries using AC-Power from a generator or the grid. How fast it can charge the batteries will depend on the charging current. For PV-Inverters the most important specification is the nominal output. Nominal output – The nominal output (in watt or kW), determines the conversion amount from DC-power to AC-power. The recommended size of the PV-inverter is normally slightly lower than the size of the solar array. For 6000Wp of solar modules, a 5000W PV-inverter is normally a good fit. This is due to the fact that solar modules rarely produce more than 80% of their rated output (only on a very cold, sunny day they might). As with most consumer electronics, inverters do not have an infinite lifetime. Just like the charge controllers, getting a good quality inverter (and associated settings) is important to protect your batteries from discharging them too much as well as wrong charging voltage/current. For AC-coupled battery based systems SMA Solar Technology have been the clear market leaders with a extensive product portfolio and a good reputation for quality. Another company with a more limited product portfolio but also a good reputation is Schneider Electric. When there is no battery integrated in the system, SMA is still a good option. However, there are also good value brands like Huawei, SolarEdge and Ginlong Solis. For DC-coupled systems, Victron Energy has a wide range of inverters and chargers and dealers are found in most African countries. Likewise, the availability of Magnum and Outbackinverters is common. However, their product range is more limited. There are a lot of Chinese/Indian brands of inverters. However, they still have to gain a good reputation for quality in most African countries. Specialized solar mounting systems, often made of steel or aluminium, ensure the solar panels stay in position. When possible, it is advised to go for a roofmount. This is cheaper and ensures that the solar panels are better protected from theft. Whether a roofmount is possible, however, depends on the orientation, pitch and structural quality of the roof. A groundmount provides the benefit of being able to place the solar panels in the optimal orientation and pitch. Usually, this groundmount fixates to the ground by pouring concrete. When solar modules were still more expensive, mounting structures where popular. These modules could follow the sun to increase the output. These days, however, it is economically more beneficial to add some additional solar modules to get to the same output. A good solar installer ensures the proper use and installement of cables and connectors. This for example means UV-resistant solar-cable to connect the solar modules or armoured cable when putting cable underground. Especially in low-voltage systems with high current it is important to use cables with a high cross-section/diameter. Designs often lack breakers, since they add costs to the system. Since breakers do add costs to the system, they are often left out of a design. They are essential to ensure the protection of the system. For example in case of a short circuit. It is also important for ensuring to be able to work on a system safely. When the costs of a solar power system exceeds roughly $5000, or when it is critical that the system remains functional at all times, it is recommended to add remote monitoring. Particularly the systems from SMA and Victron Energy are well equipped for remote monitoring. 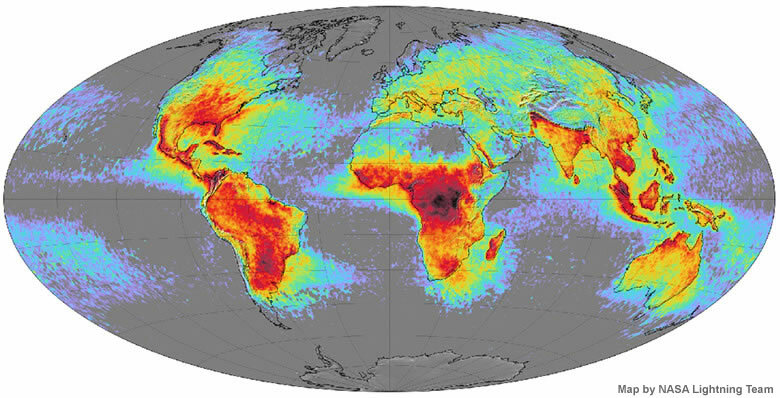 As this mapshows, the area around the equator in Africa has one of the most lightning strikes in the world. Aside from proper grounding, it is important to protect your equipment from lightning strikes. There are various protection levels possible to choose from, which should always start with a proper risk analysis. Due to the less predictable nature of solar energy it is often required to build in some redundancy in off-grid systems as it is not often accepted not to have any power during a period of high cloud cover. Increasing the amount of batteries or solar panels can achieve this redundancy. However, especially for larger systems, often it is still more cost effective to include a generator as part of the energy mix. Due to the fact that in many countries in Africa the grid has been unreliable and does not extend to all areas, there are plenty generator suppliers. Several aspects are important when deciding which one to use. First of all, it is important to check the functionality of the control panel of the generator. Second, whether this is compatible with the inverter you are using (to ensure it is possible to automatically start and stop the generator.